If you’ve ever wanted to design your own patterns but felt intimidated just know you’re not alone. Start small, easy, and practice, practice, practice. In a previous post I shared the sixth sock in my crochet sock drawer. I made five socks before I felt confident enough to experiment with a pattern. Just look at ’em all! 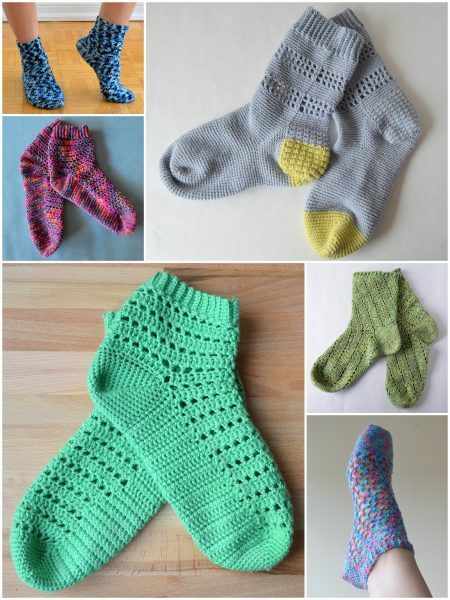 The next step is to take the plunge and make my own sock design. If you’ve ever watched chef Michael Smith you’ll know his saying that cooking without a recipe takes the stress out of cooking. I feel the same way about crochet. Step 1: Like I said, start small and easy. Step 2: Take a pattern you’ve used before, one you’re comfortable with and change it. -Why does the fabric have a slant? How can I avoid that? It’s not a bad thing, I just want to know why. -Why are there continuous rounds as opposed to ending with a slip stitch? -What if I turn at the end of the round? -Would these changes make a difference in the tension, density, drape? -What about hook size, how will that affect the look and feel? Step 4: You already know the basics, you just need to put the recipe (or pattern) away and let your creativity loose. And don’t worry about “making mistakes” or “too many stitches” or “not enough stitches” because it’s your design. Step 5: Lastly, remember to write it all down! I hope this post has inspired you to go forth and experiment. And if you’ve already started designing I’d love to hear about your adventures. What did you love (or not love so much) about making your own designs? Very reassuring advice and inspiration, Patricia, I’m just starting to design my own projects but as yet nothing more exciting than a scarf or wrap! Thank you, Eleanor! I’m so glad you found the advice inspiring 🙂 And trust me, designing your own scarf is pretty exciting!